Do you crochet? Crocheting and knitting are such wonderfully relaxing pastimes. Even if you’ve never held a crochet needle, there are so many wonderful things that you can create. I know, because although I love the thought of crocheting, it’s not my best talent. It took so long for me to figure it all out, and that’s why these 100 crochet patterns for beginners are so great – they’re all easy and perfect for you if you haven’t been crocheting long, or if you’re like me and find yourself struggling with the task a bit. 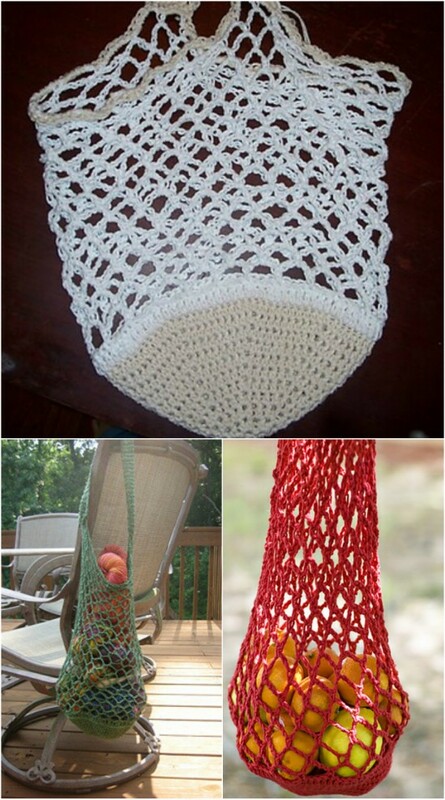 Crochet is a very versatile project and can be so much fun. You only use one crochet hook, as opposed to two needles with knitting, and the finished product is always so gorgeous. There are seriously so many things that you can make if you learn to crochet, and I’ve found a great collection of easy patterns for pillows, hats, bags, hanging baskets, and so many other wonderful things, like these 20 free crocheted hat patterns that I shared previously. Whether you crochet for yourself or to give as gifts, you are sure to find a pattern in this collection that is perfect for what you want. Imagine giving a hand crocheted baby blanket as a gift at your next baby shower or maybe making a new headband for your little girl. Most of these patterns take very little time so you could finish a couple in just a couple weeks, or even more than that if you’re pretty good at crocheting. Be sure to also check out this gorgeous mermaid blanket crocheting pattern. It’s sure to be a favorite with girls of all ages. I have a great pair of crocheted shorts that I bought for vacation this summer and let me tell you, they were not cheap. Luckily for you, there’s a pattern in this collection that replicates those same shorts, and the cost of yarn is much less expensive than what I paid for my shorts! Seriously, you’re going to find something in this collection that you just have to make and I can’t wait to hear which pattern you tried. Because they’re all so easy, I’m even going to dig out my crochet hook and try a few of them myself! 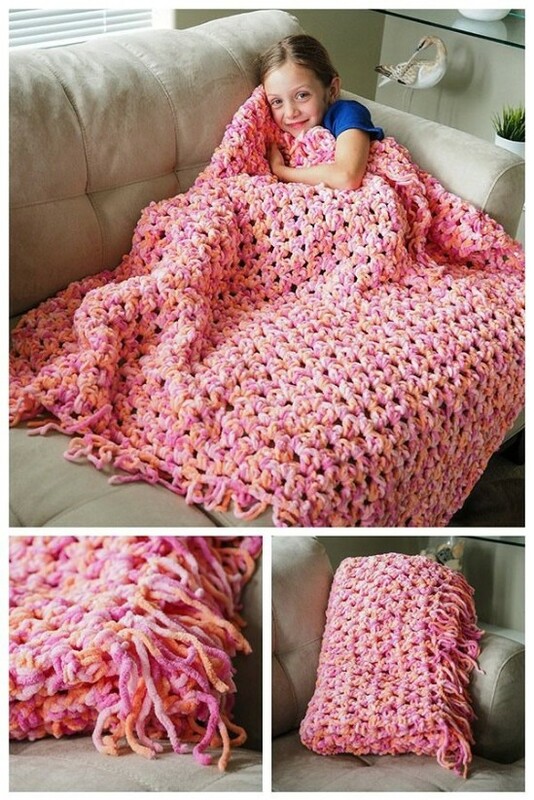 Okay, so even if you don’t crochet, you have to admit that this blanket is absolutely stunning. I love the details in the stitches and what’s even better – it’s so easy to make! This is a great blanket for giving as a gift or keeping for yourself. You’ll need a size Q crochet hook and your yarn in whatever color you choose. It takes about 13 balls of yarn – this is a really large blanket! It also takes only a few days to make, even if you’re new to crocheting, you can have it finished in about a week. This soap saver is great for holding those little ends of soap that are left over when the bar gets smaller. The pattern is so easy to make and allows you to use your soap until it’s all finished – even with the little bits and pieces. This one takes an H crochet hook and just very little yarn. It’s also a really simple project that you can easily have finished in a day, even if you aren’t an avid crocheter. 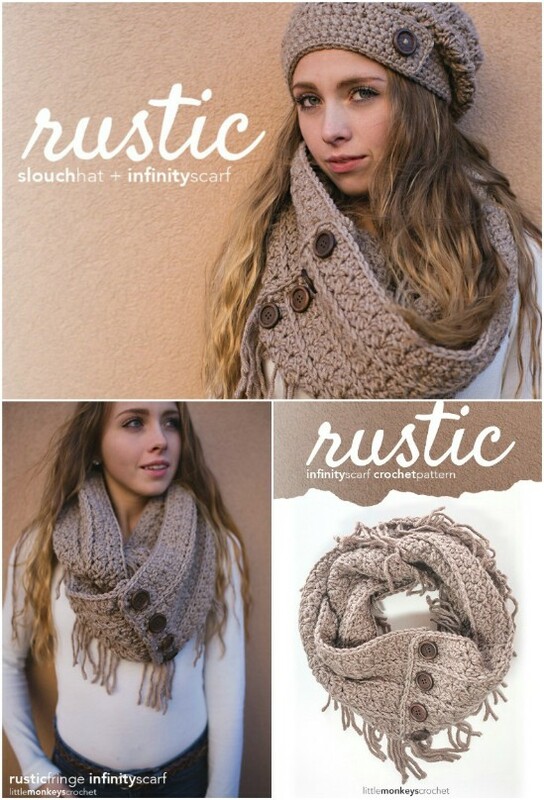 This slouch hat and infinity scarf go together and both of them are really easy to crochet. These would also make wonderful gifts and they’re just so stylish! Bulky weight yarn works wonderfully for this one and you could do so many different colors. Imagine having a great hat and scarf to match every outfit! Both the hat and scarf take little time even for beginners and are great for showing off your skills. If you’re really new to crocheting, this chain necklace is the perfect place to begin. There is very little crocheting needed to create it, so it’s a wonderful practice piece. 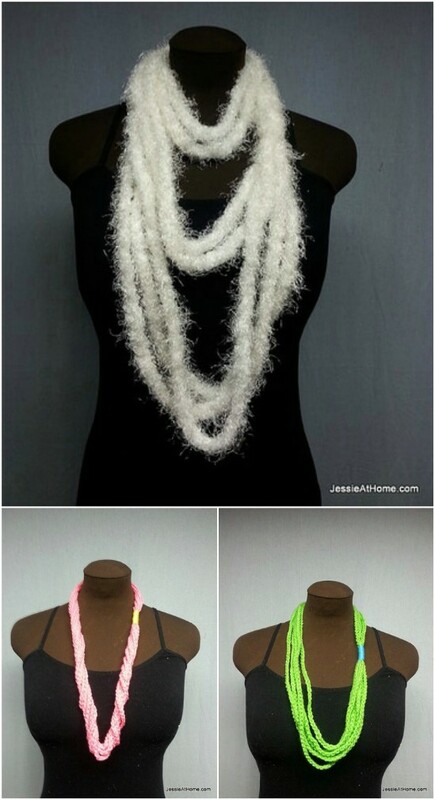 Plus, when you’re finished you will have this amazing homemade necklace to wear. You could even do this with different colors if you want to up your skillset just a bit and make the necklace more easily matchable to everything in your closet. No, you won’t be storing popsicles in the bag when you’re finished. This is a pattern for a great summer snack bag that looks like a popsicle. It’s also a great place to keep sunglasses, water bottles, or your cell phone safe and handy when you’re at the lake or beach this summer. I love the red, white, and blue color scheme. You’ll get to practice changing colors of yarn while you work, and the overall project is really easy and can be finished in just a few hours. I have to tell you, I’m a sucker for a gorgeous afghan. I have so many of them all over the house. They’re great for decorating the backs of couches and chairs, for beds, or just for cozying up to when it’s a bit cool outside. This one can be done in whatever color you want of course, but I really adore the off white look. It’s also easy and you can finish this in about a week or so even if you’re not working for more than just an hour or so a day. Oh my goodness this little giraffe is cuteness overload. Honestly, he’s just too adorable and would make a wonderful gift at your next baby shower. Or, you could make one for your own little one. You could totally do this in pink or blue or choose a neutral color like yellow. It’s such a lovely little baby cloth project and one that doesn’t take long at all to complete. 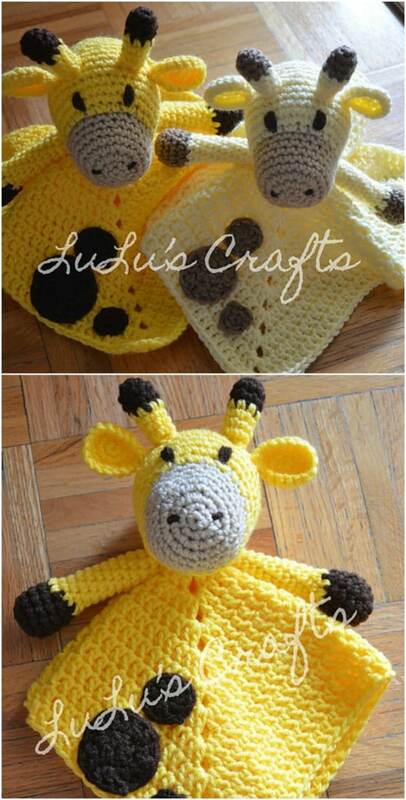 You may even want to make a couple and create a little zoo basket. I really like this little ruffled bag. I think if you’re a bit more skilled, you could totally do different colors or even create a chevron like pattern with this one. 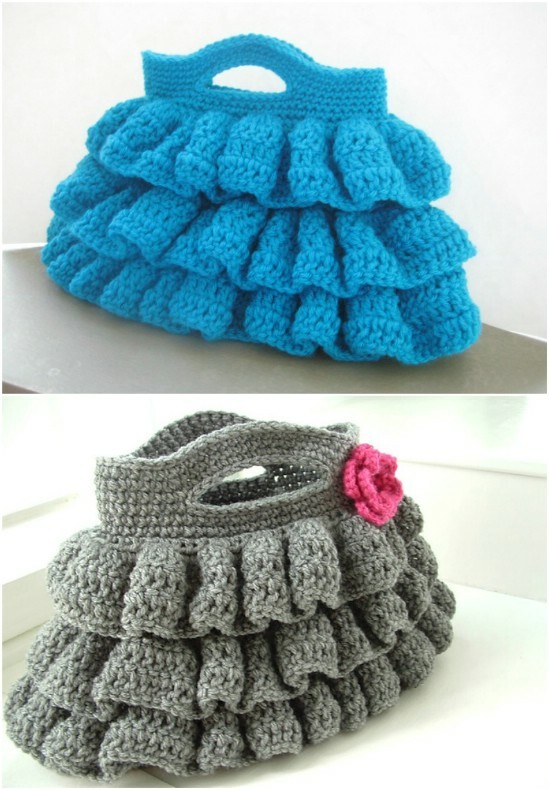 Believe it or not, the ruffles aren’t even that difficult, and this is a great bag for your first crochet project. The bag is just a bit larger than a clutch, so it’s relatively small – perfect for holding lipstick, cell phone, and other essentials for a night on the town. So, summer is coming – not quickly enough for some of us, but it’s coming nonetheless. 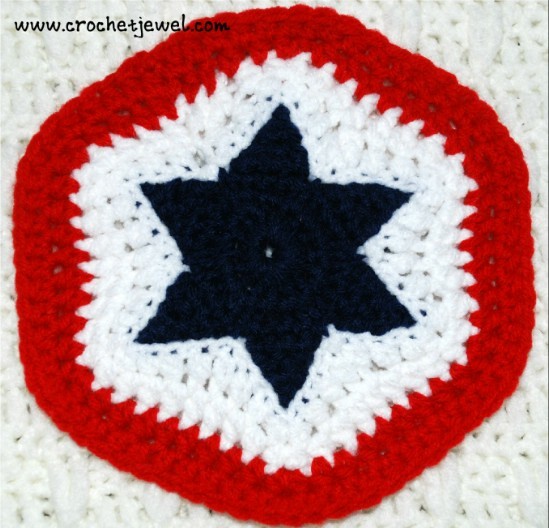 This Fourth of July potholder will be perfect this summer for your barbecues and family get-togethers. It measures about seven by seven inches when finished, and has a gorgeous star right in the center. 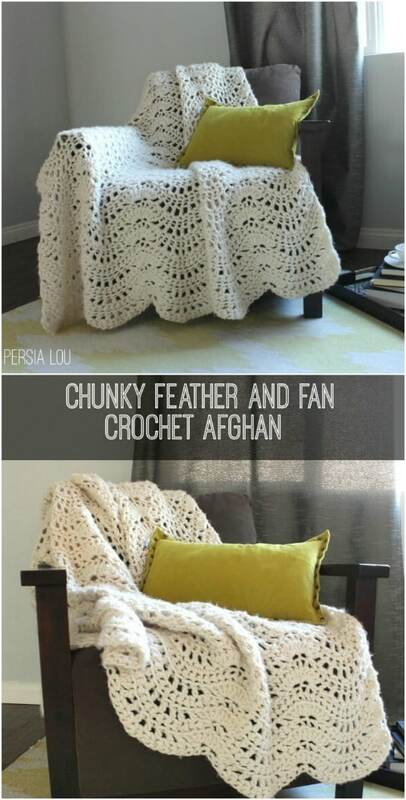 You could easily make a few of these in a week, even if you’re just crocheting at night after work. Granny squares are my favorite crochet pattern. I love how they look when they’re finished. These owls would make wonderful potholders or you could put them all together to form a blanket or any number of other wonderful creations. As complicated and gorgeous as they look, they’re really easy to make and you can customize them with whatever colors you want. I really needed this pattern when my kids were younger. It’s a snuggy to hold a popsicle and it’s wonderful. Kids love popsicles, you know those thin ones in plastic, but they really do get very cold. These snuggies will keep your little one’s hands from getting too cold and allow her to enjoy her popsicle at the same time. Messes aren’t a problem either, because you can wash the snuggy when you need to. You could make several of these in a week, and it’s the perfect project for summertime fun. These trinket boxes are great for décor and for organizing. They’re also great for giving out as Mother’s Day gifts or for any special occasion. Use them on the dresser to hold rings or earrings and keep them in place. The pattern is really easy, and since the boxes are small, they won’t take you long at all to make – even with the tiny lid. Note that the pattern only covers the box itself – you’ll have to make the decorations separately if you want to decorate your box. This cowl scarf is gorgeous no matter what color you choose to do it in. The shell stitch is really easy, even if you’ve never done it before, and it makes this scarf look really beautiful. You’ll need a 6 mm crochet hook and worsted weight yarn. Four skeins of yarn make a 60 inch cowl, so you can alter the number of skeins you need based on how long or short you want the scarf. The overall workup is really easy though and you can probably finish this in just a few hours. 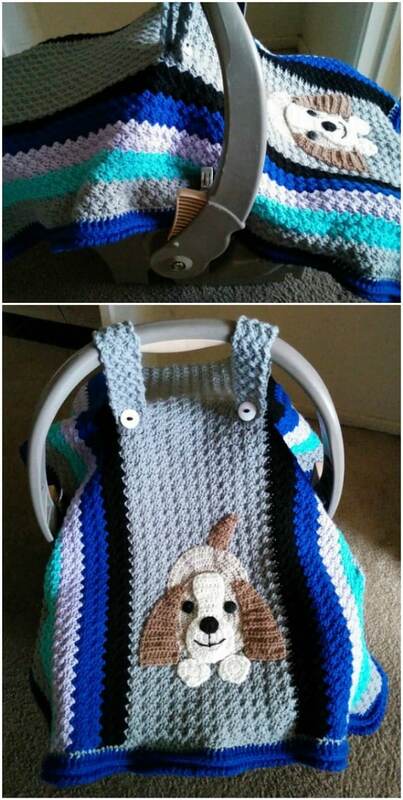 Any new mother will love receiving this crocheted car seat cover that you can easily make in just a few hours. If you really want to be creative, you can add a crocheted character to it, or just leave it plain. It’s gorgeous either way. The cover protects babies from wind or sun – just like those that you buy in stores. But this one is homemade, and that is after all, the best way to do things. So, we’ve seen a pattern for a crocheted chain necklace. 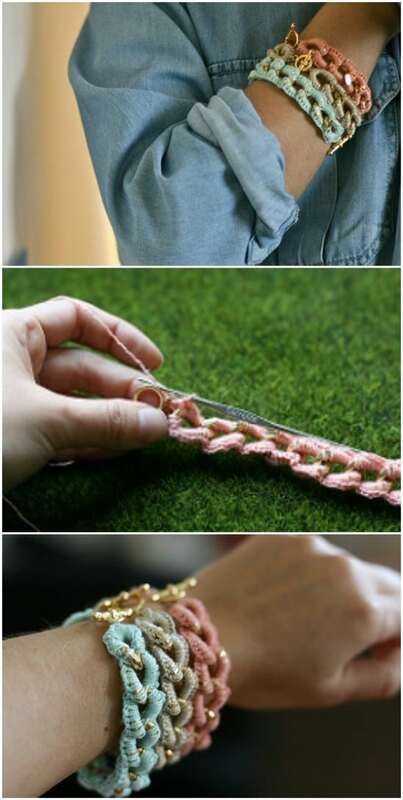 This one is for chain bracelets that are even easier to crochet than their longer counterparts. You’ll need bracelet hooks to hold the chains together – and this one is done in three different colors which makes it look absolutely gorgeous. This is another one that you can finish in just a few hours, and it’s perfectly simple for those who have never crocheted before. This is a really easy project for a cute little copy for your morning coffee mug. You could probably adjust the pattern to fit any number of cups or glasses. I love the buttons that hold it all together. These would make wonderful gifts for anyone you know who really enjoys their morning coffee or you could make a matching set for your own kitchen. 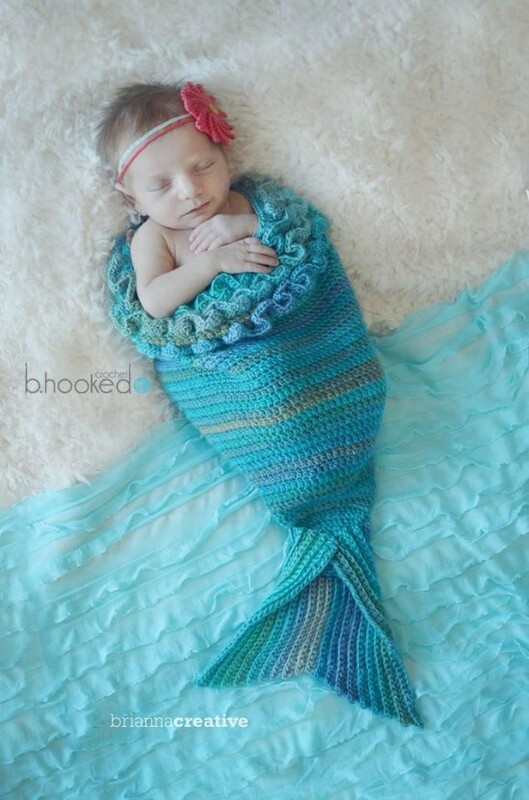 I absolutely love this little mermaid cocoon for babies. It only takes two skeins of yarn to make the cocoon including the tail and ruffles at the top. I love the entire look of this and any new mother would really love it as a gift for her little girl. You could do it in any number of colors and even change out colors if that’s part of your skill set. This one looks a bit more complicated but can still be completed easily in just a few hours. You won’t believe how easy this adorable crocodile pixie hat and booties are to crochet. You’ll definitely want to give these a go if you have a little one coming or if you know someone who is expecting. There are three sizes available; ranging from newborn to 24 months, so this one is great for mothers to be or new mothers. 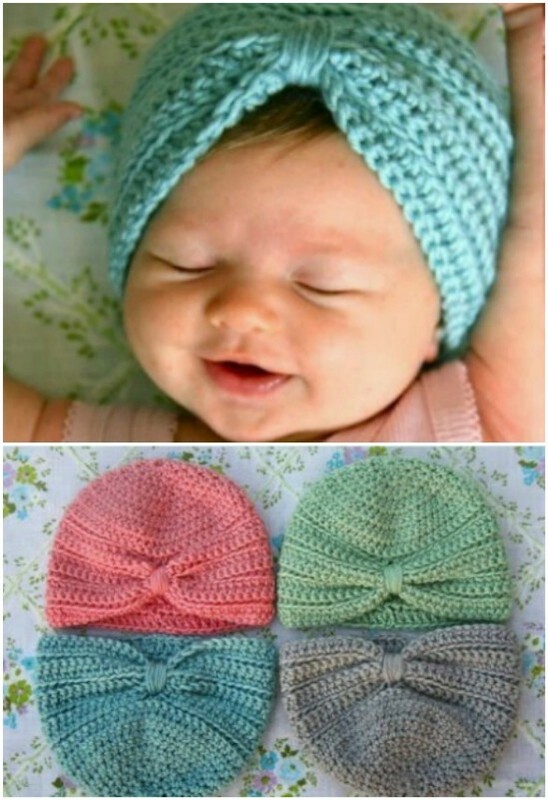 I love the vintage look of the hat, it has such a frontier bonnet appeal to it, and the booties are just too cute. Speaking of baby booties, these cuffed booties are just entirely too adorable. The little buttons on the side really makes them stand out, and I love that you can do the cuffs in a contrasting color from the actual bootie. The pattern fits sizes six to twelve months, but if you know how, you could adjust it for smaller or larger sizes. There’s also instructions on how to create the cute little flower for girls. Done in two different colors, this tank looks really complicated, but it’s actually something you can complete in just a couple of hours. You’ll love sporting this crocheted tank at your next beach vacation, and it is certain to get loads of compliments. Sizes range from extra-small to extra-large, so you’re sure to find the right pattern and there’s even a nice little slit up the side to add to the beauty. This is such a great tank top and so easy to make. Ear warmers are so in style right now, and you can save yourself about $20 if you make one as opposed to buying it. I really love the big crocheted flower on the side of this one. 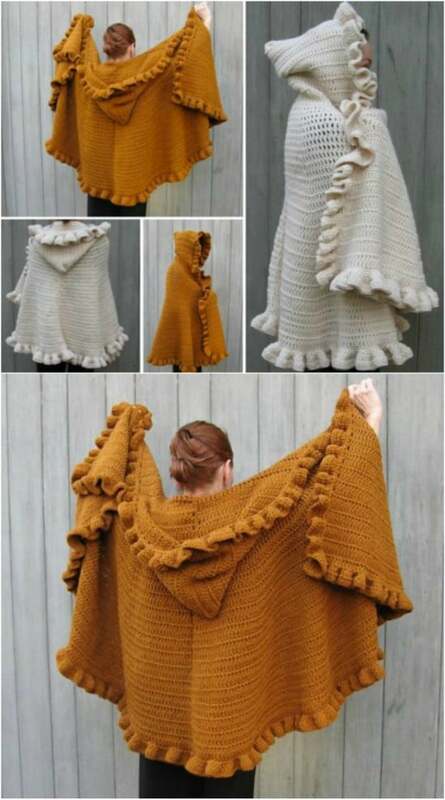 I bought one similar a few months ago and paid way too much for it, considering I could have made it in a couple hours and for just a couple of dollars’ worth of yarn. I also like the grey color, but you could do this in any color that you want – or several colors and have one to match every outfit. How adorable is this little turban for little girls? This is honestly the cutest thing I have ever seen. It’s really easy to make, and would be a wonderful gift for anyone you know who is expecting a girl. You can easily make this in just a couple of hours, and in so many beautiful colors. You may also be able to adjust the pattern to make it a bit larger if you need something that’s not just for newborns. 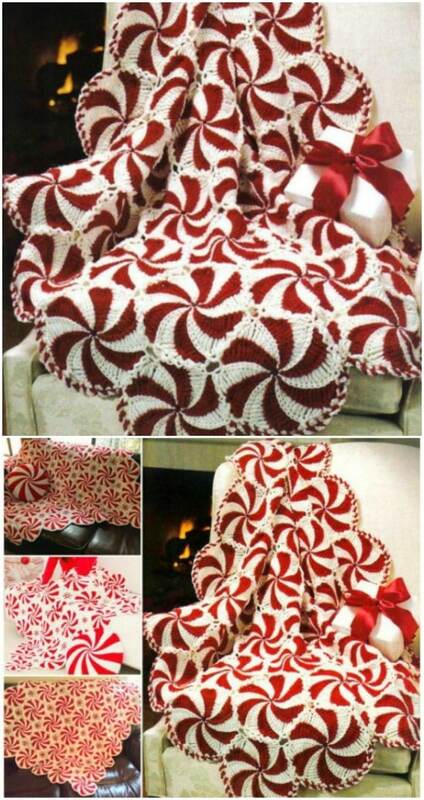 Christmas may be over, but it will come again and you can really be ready when you take the time to crochet this beautiful peppermint swirl afghan. The red and white coloring is gorgeous and this is such an easy pattern. You’ll need two colors of yarn of course, and you can even make a pillow to match – there’s a pattern for that, too. You have plenty of time to get this done before the holidays roll around again. Go ahead and make more than one – keep one for yourself and use the others as gifts. You could use this great tote for the beach or make one to use as a reusable market bag. Either way, it won’t take you long to create and the finished project is just beautiful. I love the contrast in the coloring, but you could do this in a single color if it’s easier, especially if you’ve never done multiple colors when crocheting. This really is a breeze for beginners and doesn’t take nearly as long to make as you may think. 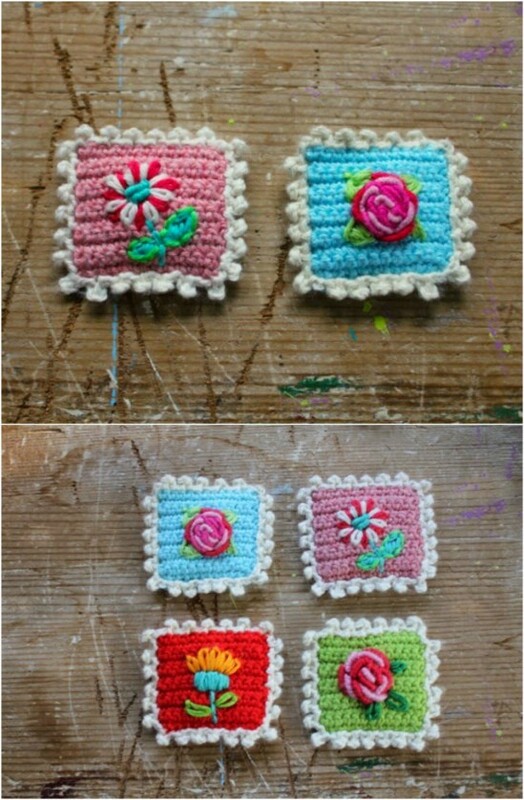 These little crocheted coasters are really pretty and they don’t take long at all to create. You could make an entire set of four in just a few hours. I love how vintage they look – think iced tea at grandma’s house. You could also do these as gifts – just give a set to anyone who you know would love them. They look like little flowers when they’re finished and have such a wonderful retro appeal. Flip flop season is my absolute favorite. I love how comfortable these shoes are, and I really love this crocheted version of my favorite shoes. You’ll need a pair of flip flops to begin, which you can pick up at the Dollar Store for a dollar. You crochet a really stylish top to the shoes, which instantly transforms them into a dressier style. I love how easy these are to make. 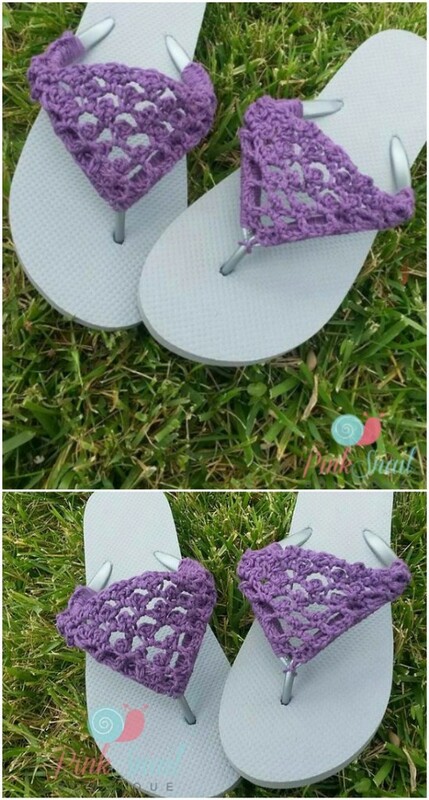 You can have an entire set of flip flops done in just a couple of hours. I bet you didn’t think crocheting a teddy bear would be easy, but it is. The bear is crocheted with two strands of yarn held together while you work, which isn’t as difficult as it sounds. Once you’ve finished with the crocheting, you just stuff him with pillow stuffing, or use up some old rags or clothing, and he’s all done. The mouth and nose are embroidered and eyes are buttons. This is such a cute little bear and any child is going to love him. I have a pair of lace shorts and let me tell you, I paid a lot for them. You don’t have to though, because you can crochet your own. These shorts are very in style right now and are so gorgeous. They’re perfect for casual or even dressier occasions. If you wanted, you could sew in something so that they’re not see-thru, or just use them as a cover up for your bathing suit when you hit the beach. The pattern makes it look so easy to create them, and I really love that wide satin ribbon at the waist. This pattern isn’t just for one, but three baskets. You can create an entire family of baskets, which would be perfect for holding sewing and crocheting projects, yarn, and needles. I love these for storage options, as well. If you don’t want an Ombre or striped look, you can just use one color of yarn for each basket. They are super easy and won’t take long at all to crochet. You could have all three finished in just a week, even if you don’t work on them for hours every day. You could easily just head to a department store and purchase this boho bag for around $30 or so, but then again, you wouldn’t have the joy of saying that you made it. Plus, you can easily create this gorgeous bag in about three hours, and with just a few supplies. This is one of the easiest bags to crochet, and is really beautiful with the tassels hanging down. You’ll need leather strips and a few other purse making supplies, but the gist of the work is in the crocheting. This lovely blanket is super soft and super easy to crochet. It’s also huge, which is perfect for beds or for cuddling up on the couch and watching a great movie. I really love the fringe on the ends, but you could probably leave that out if you wanted. This is one of the easiest blankets to crochet so it’s perfect for beginners, and it won’t take you long to make even if this is your very first crochet project. Okay, if you’re going to crochet then you really need to learn the granny square. These little granny hearts would be perfect for putting together a Valentine’s Day blanket or scarf or even making a throw for someone that’s getting married. It’s not nearly as complicated as I thought it was to make a granny heart, so I’m sure you’ll find it easy, too. You can practice on these if you’re just beginning and see how well you’re improving from heart to heart. Then put them all together and make yourself a nice little blanket. Here’s another really easy pattern for a great blanket. I love the black and white stripes. 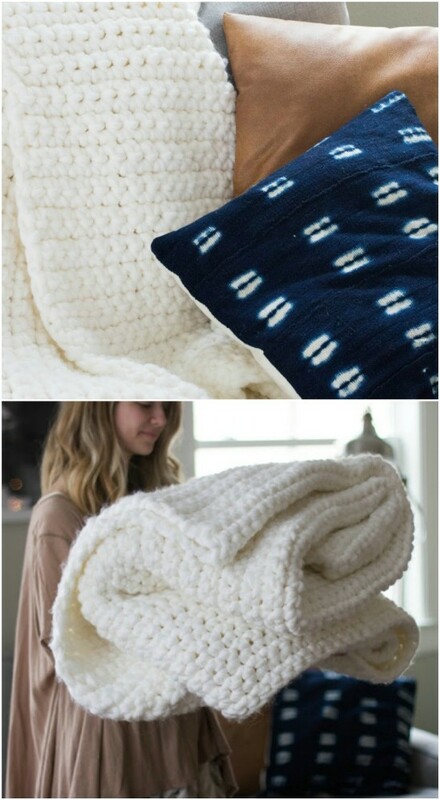 This gives you a chance to work on changing colors, and you end up with a really nice throw blanket that’s perfect to display on the back of your couch. You can use other colors, of course, just choose two different colors so you can practice on those color changes. The yarn will cost around $20 depending on whether you find it on sale, and you’ll need a few hours of work time. This cupcake is in the collection just because I think it’s so adorable. This is a great project if you have kids and want to give them play food that’s also soft – perfect for smaller children who still tend to put toys in their mouths. You don’t even have to crochet that much. Once you’re finished, you gather the material up to look like a cupcake. I love the idea of having these in little girls’ rooms for décor or maybe even integrating them into a pillow? 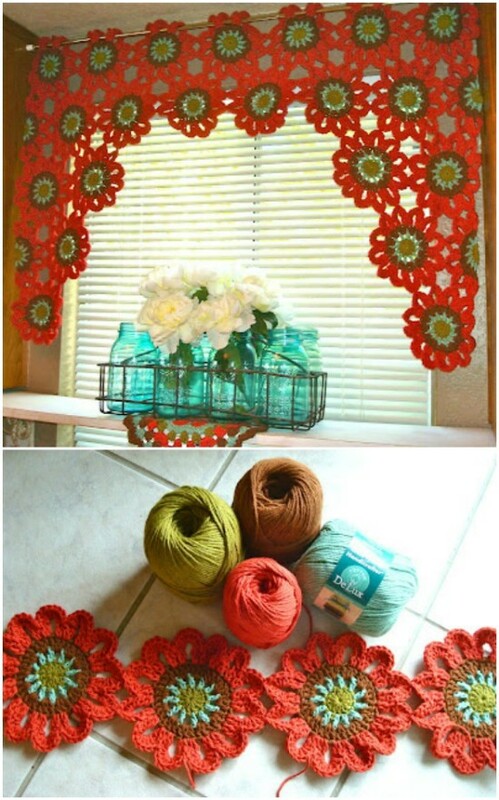 Yes, you can even crochet curtains for your home, even if you’ve never crocheted before! 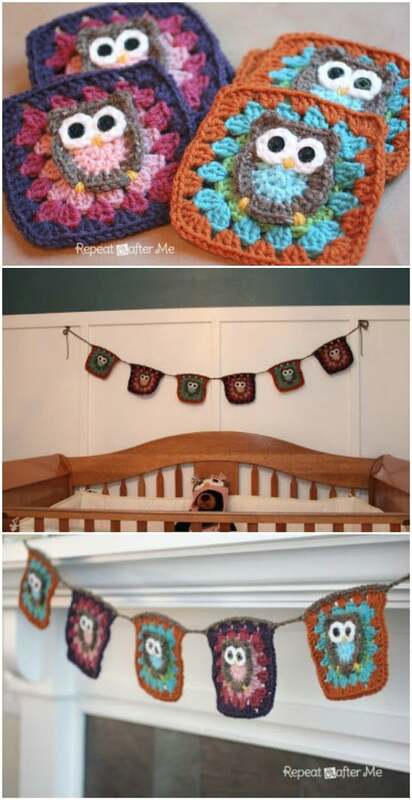 I love this crocheted valance – it’s easy, colorful, and such a unique idea. 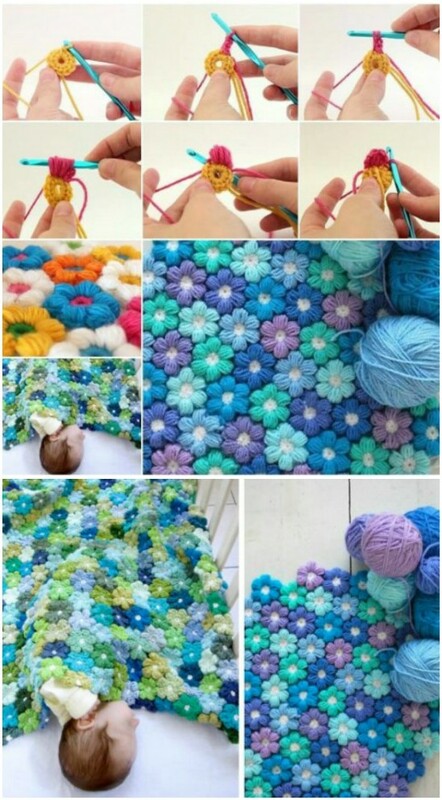 You’ll be crocheting separate little flowers and then joining them all together to make the valance. This really works up quickly and is a perfect valance for the kitchen or even bathroom – just wherever you want to display your handiwork and add a nice splash of color. This headband looks much like the ear warmers, but it fits a bit differently. I really love the large bow on the side, and it’s great anytime you want that pin up look with your hair. 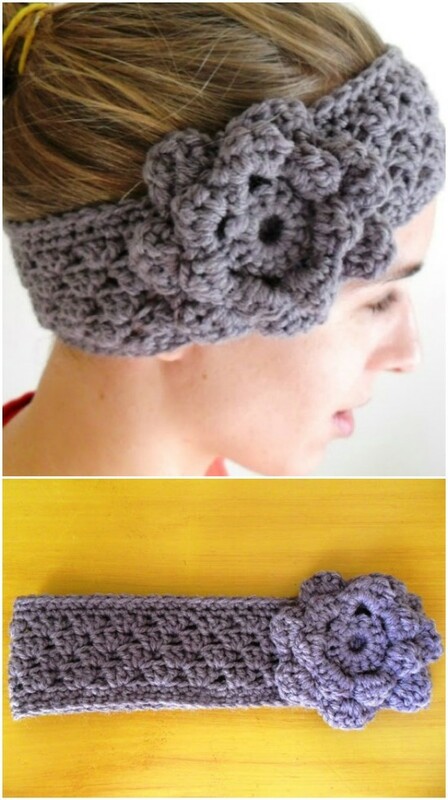 The pattern makes a one size fits all headband, so there’s no need to adjust it for age. It will stretch to fit when you wear it. The pattern looks really simple so you could probably finish this off in just a couple of hours. This bunny hat and matching diaper cover are just too adorable. You could get your little one all ready for Easter with this matching outfit, and you’ve got plenty of time to finish it. I love the white and pink combination for girls, but you could totally change up the colors for boys. It even has a pom pom tail! I love everything about this, especially the fact that it is so easy to make. 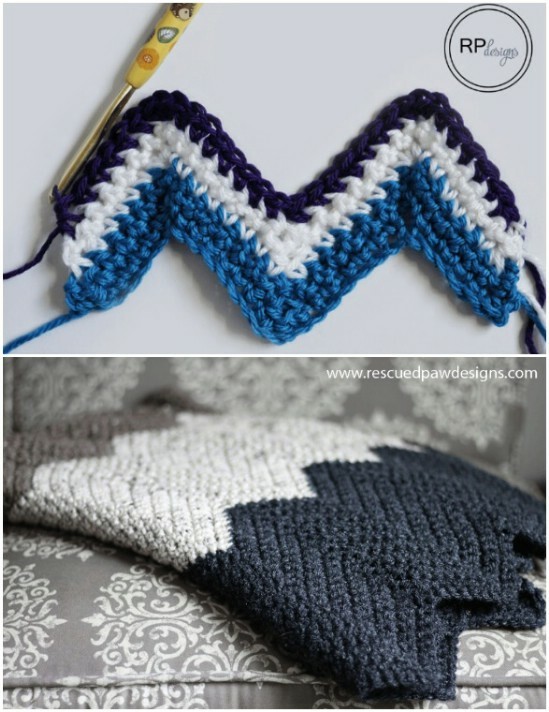 So, this chevron pattern is gorgeous and you could make so many things with it. If you’re a fan of the chevron look, you can turn this into a hat, scarf, blanket, or any number of other wonderful crocheted items. The pattern itself is not at all difficult, and teaches you to integrate three different colors of thread into the same project. This ornament may be a little late for Christmas, but don’t worry – there’s another one coming soon, and you have time to make enough of these to completely decorate your Christmas tree in retro ornaments. This is an easy project, and great for practice. It’s about four by four inches in diameter, and won’t take long at all to create. If you have a snowy Saturday, this would be the perfect way to pass some time. This is a beautiful heart head warmer that you can crochet in just a couple of hours. If you don’t want it for Valentine’s Day, you could make it with any color of yarn – and it doesn’t take much yarn to create it. Or, leave the heart off and just make the head warmer – you could have that finished in about an hour or so. It’s really versatile and your little one will adore it! I love ponchos. They are just so versatile and stylish at the same time. This great poncho is really easy to make and can be done in so many different colors – you could have a poncho for virtually every outfit. These look great when paired with boots or you could just have it on hand in case you get chilly at outdoor sporting events. 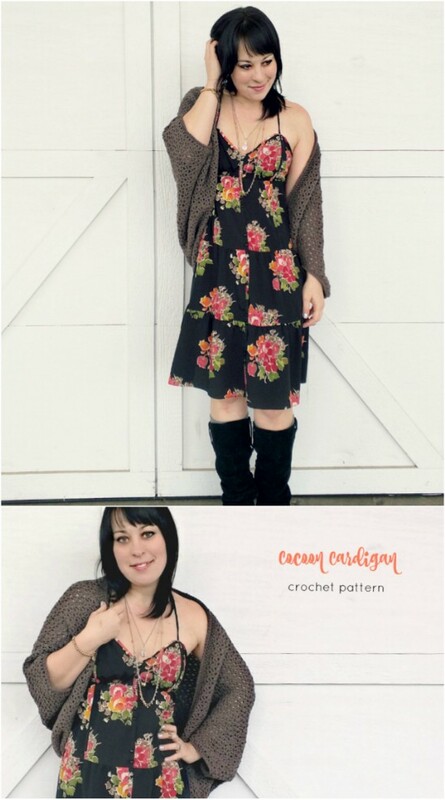 The one piece pattern makes it a cinch to crochet, and you can totally have it done in just a few hours. 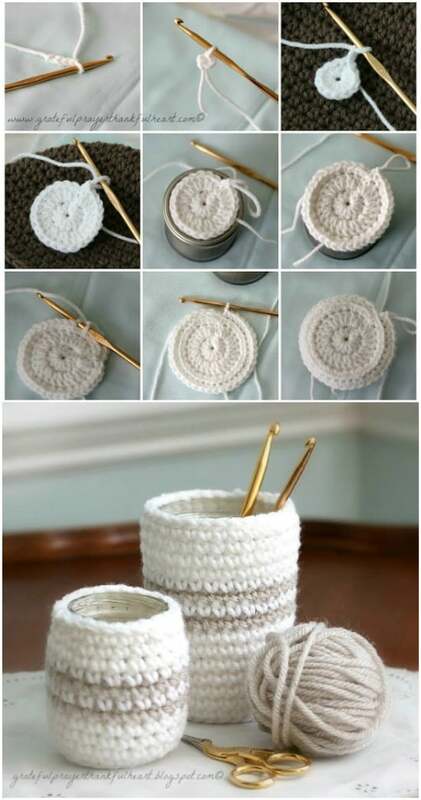 Here’s another way that you can crochet nice baskets. This pattern doesn’t call for yarn however – it calls for fabric. Use fabric scraps or upcycled blankets to create them. You use a larger crochet hook for these and they are absolutely gorgeous when finished. 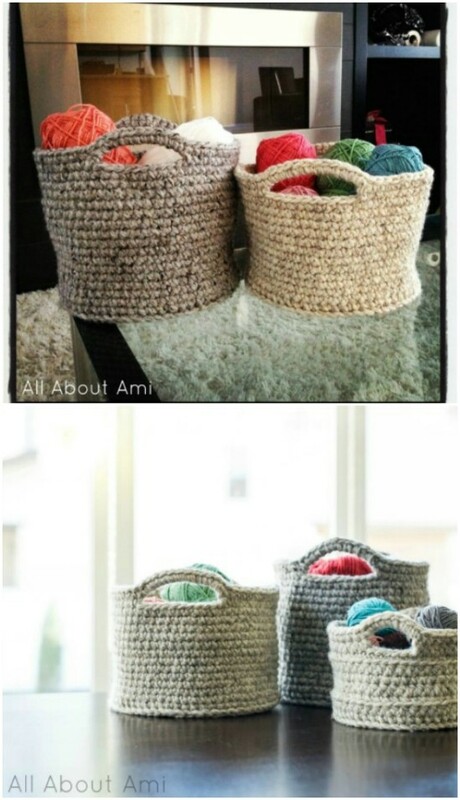 Fabric baskets are so great for storing all sorts of things and these are really simple to make. You can have a basket finished in about an hour or so. I love crocheted pillows. They make me think of my grandmother’s house with their retro charm. These pillows are very easy to make and you can make several to have them all over the house. Each pillow needs just two skeins of yarn and some pillow filling – or use upcycled fabric if you prefer. Do these in any number of colors for the couch and living room chairs, and you can even adjust the pattern to make them different sizes. Imagine having lovely roses all over your house! 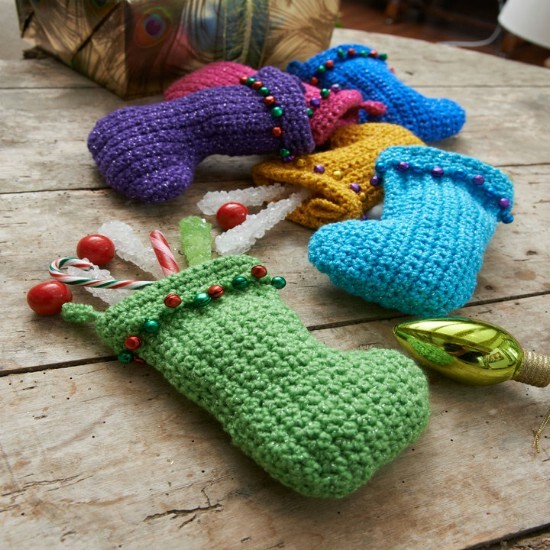 You can easily create these with a bit of yarn and your crochet hook. These are great for practice and once they’re finished, you can display them in a vase or use them to add embellishments to your headbands, pillows, or anything else you want to add a bit of vintage style to. The pattern is so easy to follow and the roses themselves can be made in less than an hour each. 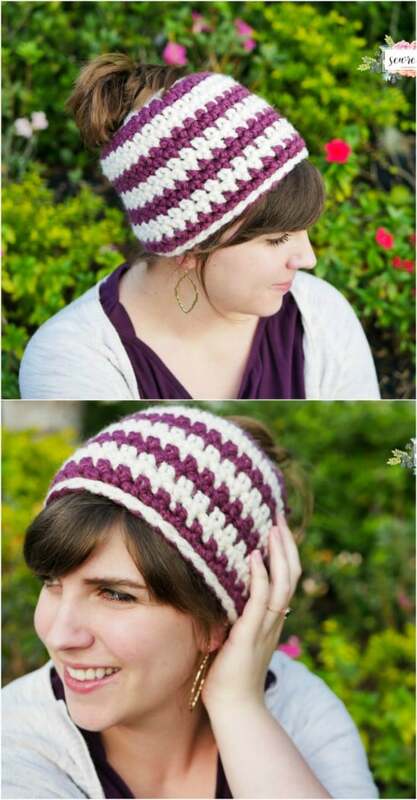 Here are two different ways that you can easily create a crocheted beanie type hat. One has a pom pom on top and the other doesn’t, so you can choose which one you want and get to crocheting. This is a good project for your first crocheting experience as the pattern is super easy and they don’t take long to create. You’ll get loads of experience with the crochet hook, which will get you ready to tackle those harder projects. Flannel baby blankets are great and all, but they can be so boring with regards to style and design. Here’s a great tutorial on how to add a nice crocheted edging to otherwise plain blankets, giving them a great new look. 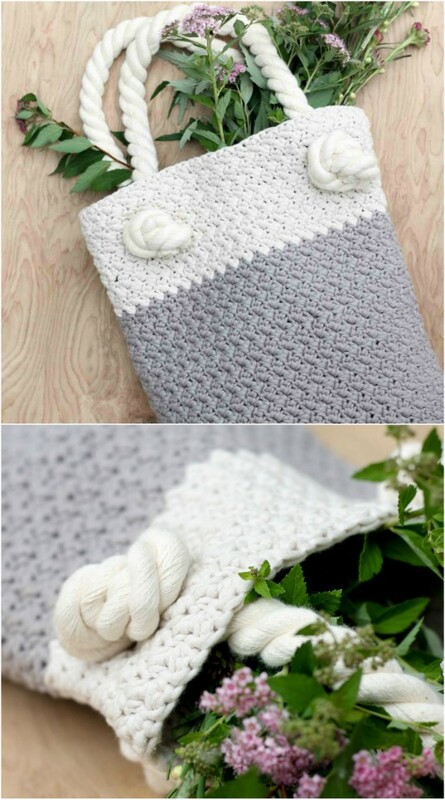 If you’re attending a baby shower soon, this is a great way to make your receiving blanket gift a bit more personal. Plus, it’s really easy and gives you loads of practice with crocheting. A crocheted bath pouf? I love this idea! Imagine how soft this would be in the shower, and you can throw it in the washing machine as needed, too. The great thing about this is you can’t really get it wrong. Even if this is your very first crocheting project, you won’t be able to tell if you mess up a stitch, so it’s a wonderful project for practicing with your hook. Plus, who wouldn’t just adore getting a personalized crochet bath pouf as a gift? 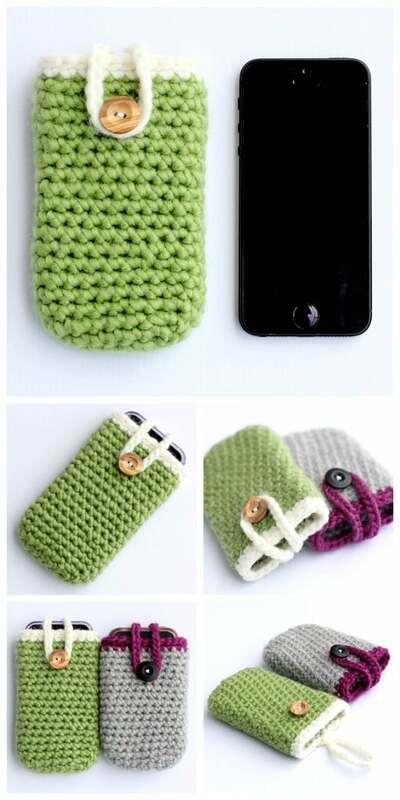 This crocheted iPhone case is really stylish and really easy to make. It will only take you about an hour, even if you’re new to crocheting. You can do two colors or stick with just one if you’re a beginner. It keeps your iPhone snug and protected – and you could adjust the pattern a bit if you need to make it fit a different smartphone. 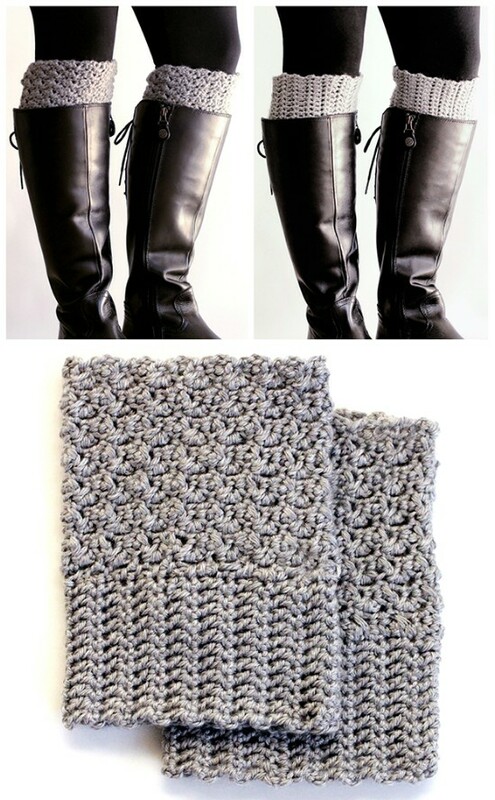 I love these crocheted boot cuffs. I really love that they’re reversible and that they are so very easy to make. Each one will take you about an hour or less. There’s really nothing to it except your stitching – no fancy stitches or joining colors. You just follow the pattern twice to make two boot cuffs. These are so unique and so much cheaper than buying cuffs in the store – they’re also handmade so you know you’re going to love them so much better than anything from a department store. I had a pair of crocheted slippers when I was younger, and I really loved them. I believe I’ll make myself a new pair since this pattern is so very easy. You could totally create these in an afternoon, and they’re the perfect thing for lounging around the house on a cold morning. There’s also a tiny crocheted heart that you could make to decorate your slippers or you could leave that off if you prefer. Every little girl in the world loves Elsa from Frozen. You can make your little girl so happy with this easy to crochet Elsa hat. Or, if your little one prefers Anna, you could make that instead. These hats are so creative with their long braids running down the sides, and they are very easy to crochet. 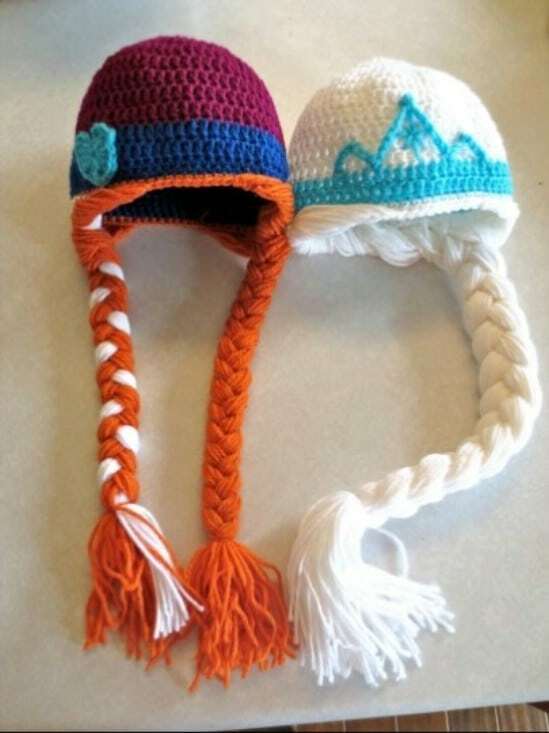 If your little girl loves Frozen, this is the perfect winter hat for you to practice your crocheting on. Oh my goodness these little baby flip flops are adorable! If you have a baby coming or know someone who does, these are going to make the perfect baby gift. They are super easy to crochet and the most adorable baby shoes I think I’ve ever seen. The pattern can be adjusted to make sizes from newborn to twelve months, so you can make a pair for every baby girl you know. Remember to make two of the pattern to get a pair of shoes. You can make one of these face scrubbies in about 15 minutes, even if you’ve never held a crochet hook. Make several of them to have them on hand or give them away to your favorite girlfriends. They’re super easy and take very little yarn for each one. I love the idea of putting these in a facial basket to give away as gifts – and they’re perfect for girls’ night out parties. Popcorn stitches are gorgeous and you can easily learn them with this popcorn stitch flower pattern. This is a really easy project and one that will only take you a few minutes once you get the hang of it. 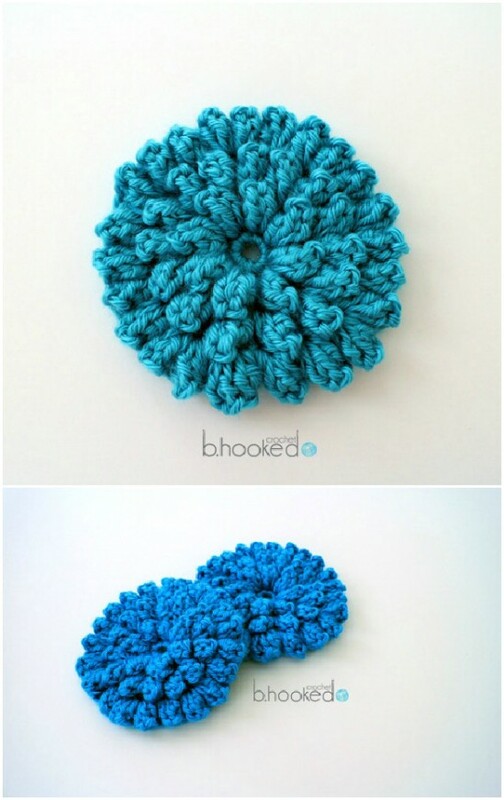 You just begin and then crochet into a circle to finish off the flower. Use the flowers to decorate your headbands, pillows, ponchos, or any number of other DIY projects. Create these easy to crochet jar cozies for your mason jars and use them to decorate all over the house. 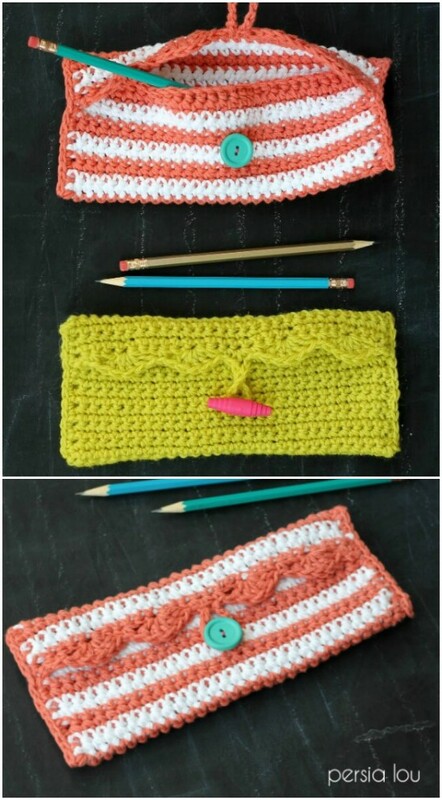 You can use them as pencil holders or turn them into the perfect place to store your knitting needles and crochet hooks. They also make great vases – just whatever you want to do with them. The pattern itself is really easy to follow and you can make one of these in less than an hour no matter what your skill level. A bangle bracelet is a nice accessory for any outfit. These crocheted bangles are perfect for all occasions and are so easy to make. Teens and girls of all ages are going to love them. You should be able to make one in less than an hour, and you can do multiple colors in different bracelets or combine your colors in one if you know how to join colors. This is a really good project for snowy days, and you get a stylish bracelet to show off when you’re finished. I love hair ties – I love a lot of things actually, but I really do use a lot of hair ties. 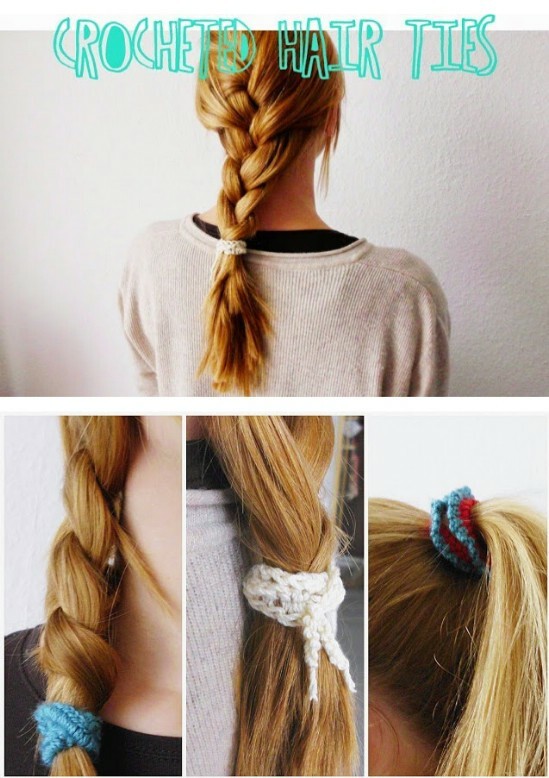 This crocheted hair ties pattern makes it so easy for you to never run out of those long hair necessities. 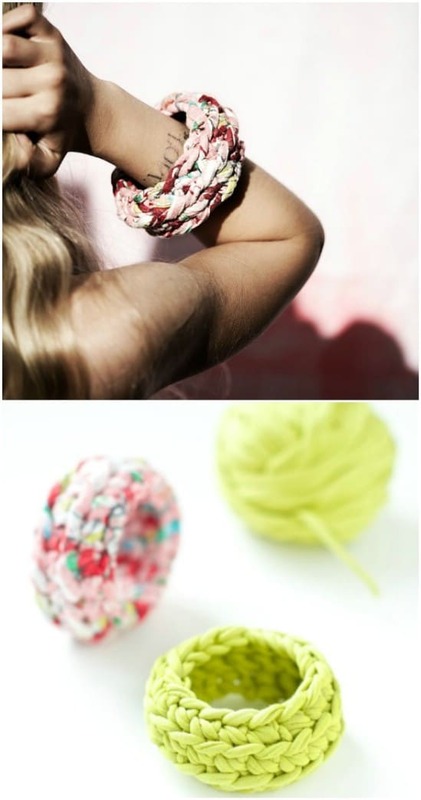 You can make a hair tie in about 15 minutes or less! Take a couple of hours and make one of every color so you always have something in the color that you need. I love this idea for keeping hair ties in the house – you know, those things just disappear all the time! 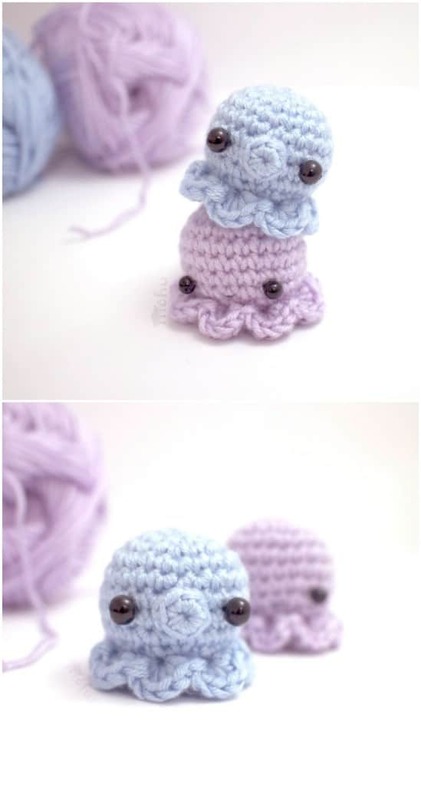 Any child will adore these cute little crocheted octopus toys. They’re very easy to make and you can actually make several in an afternoon. I think they would be great to add to a basket for a baby shower or you could make a few of them for your own kids. Do different colors to get a nice little collection. These are a bit more complicated than some of the crochet projects in this list. You’ll need to be able to crochet in the round and it calls for single crochet and half-double crochet stitches in the pattern. This beautiful blanket could also double as a nice throw rug. It’s filled with gorgeous puff flowers, which are much easier to crochet than you may think. I love how bright and cheery this is and how puffy the flowers are! This one may take several hours but it will be so much worth the effort when the finished product is this amazing blanket. Use a collection of colors to make it really bright or you could stick to one or two colors to make the pattern a bit easier. Bow ties are cool – or at least they are according to Dr. Who. 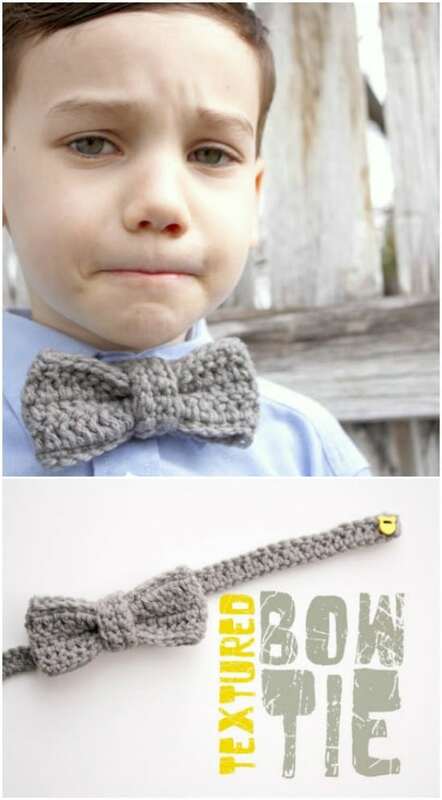 If your son, hubby, or anyone else in your life feels the same way, you can easily create these textured bow ties with just a bit of yarn and your crochet hook. These would also be really cute dog collars – you’ll need to adjust the pattern a bit for size, or you could make yourself a neat little crocheted bow tie to wear as a necklace. This pencil pouch could also be used as a small makeup bag. You can easily crochet this in about an hour or less, and I love the contrasting colors, although you can use whatever colors or color combinations you want. It’s closed and held in place with a button that slips into a yarn loop – really easy. 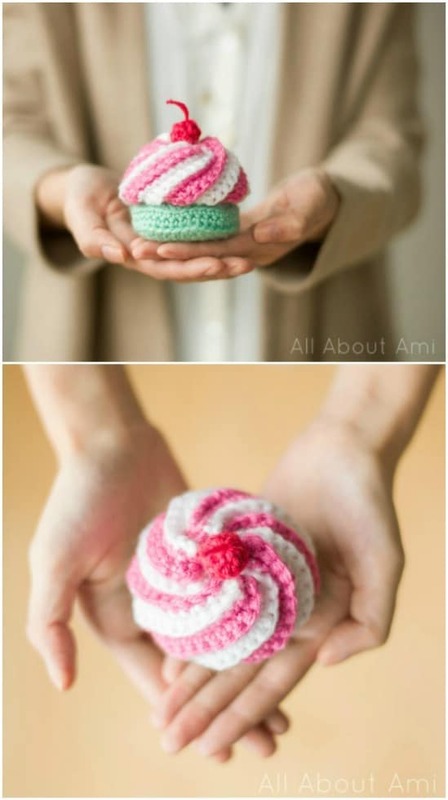 You only need one ball of yarn for each one that you make, and this is a great project for those of you who have never crocheted before. Talk about a retro project! This crocheted stool cover is very reminiscent of the 60’s with its bold colors and wild design. I love the fringes on the sides, too. The top has a great quilt pattern that you can easily make by crocheting individual squares of each color. Once you have all the colored pieces done, you just join them together and create the sides and then add the fringe. It’s easy and so colorful! Even though you’re going to be incorporating leather into this clutch, it’s still easy enough to make that it’s considered a project for beginners. Really, the crocheting part of this project is a breeze. The leather part isn’t too difficult, either. You end up with a beautiful clutch that’s perfect for those nice evenings out, and you use very little yarn for this one and only need a few hours to complete it – even if you’re completely new to the craft. 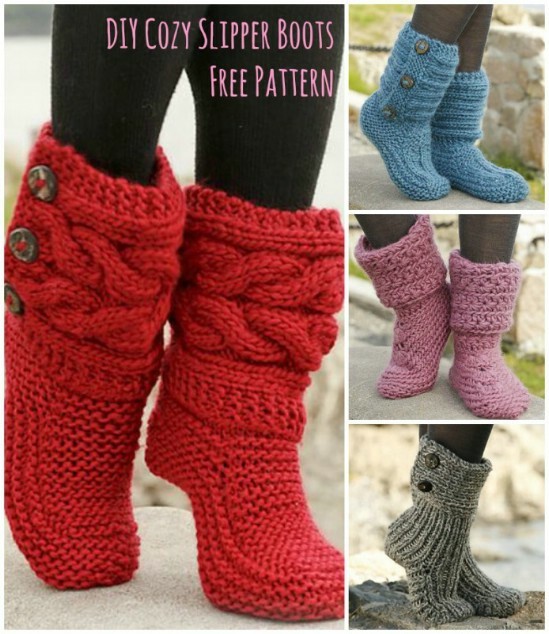 These slippers or adult booties are very easy to make. You only need 10 quick rounds to create them for each slipper, which is amazing considering they are so soft and comfortable when finished. The pattern can be adjusted to fit women’s sizes from five to ten, and you can use any combination of colors to make the slippers that you want. I can’t believe how fast and easy these are to make, and they would make a wonderful gift for someone special. 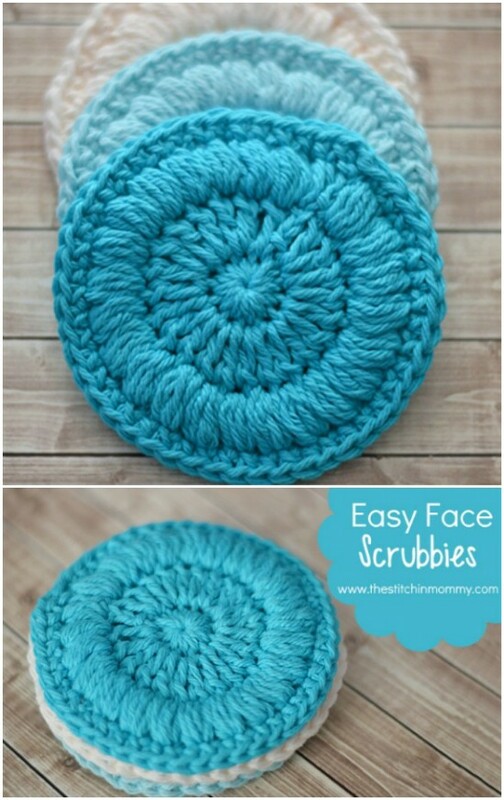 This crocheted towel holder is so simple and so quick to make. You can probably turn this out in less than an hour – much less if you’ve crocheted before. You just create the ring and then the tab, which folds over and buttons to hold your towels in place. I need this for my kitchen! You could make it to perfectly match your towels or even make a contrasting color. This easy crocheted owl basket only requires basic crochet skills. It makes a fairly large basket of 28 by 12 inches, which is perfect for holding any number of things, like rolled up towels in the bathroom. It will hold three full sized towels! And it won’t take you long to create it – even with the adorable owl motif. You use a thick, sturdy yarn so that the basket holds up by itself when it’s finished. It also collapses flat when not in use so you can store it away when needed. Snowflakes are so gorgeous, especially when they’re crocheted and not falling outside amidst freezing temperatures. I love these little snowflakes that you can easily crochet in just a few minutes each. You could use these to decorate mittens, gift bags, pillows, or so many other things. You can also apply mod podge to them when finished to stiffen them up so that they make wonderful gift bag tags. So, we’ve covered patterns for ear and head warmers, as well as mittens. How about these amazing hand warmers? They’re fingerless, so that makes them much easier to crochet. You could easily have a pair of these finished in an afternoon and if you do them in multiple colors, you have a pair to go with every outfit. 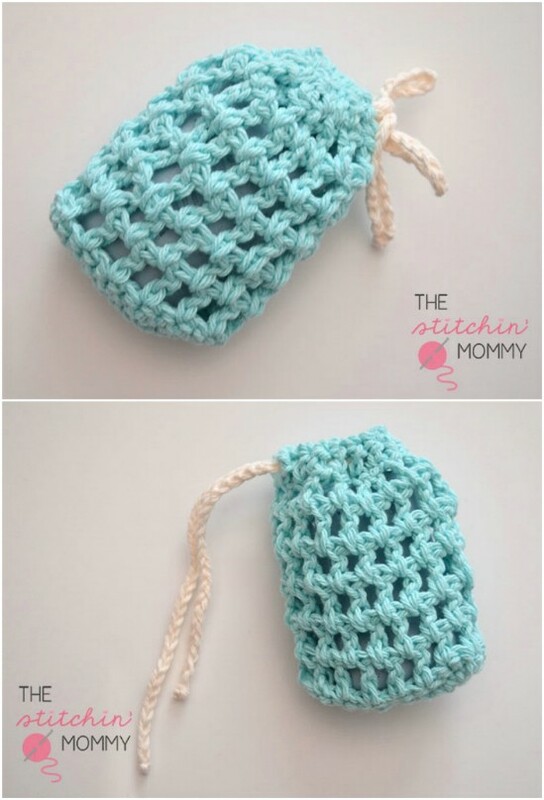 I love the look of hand warmers, and I really love how simple these are to create. 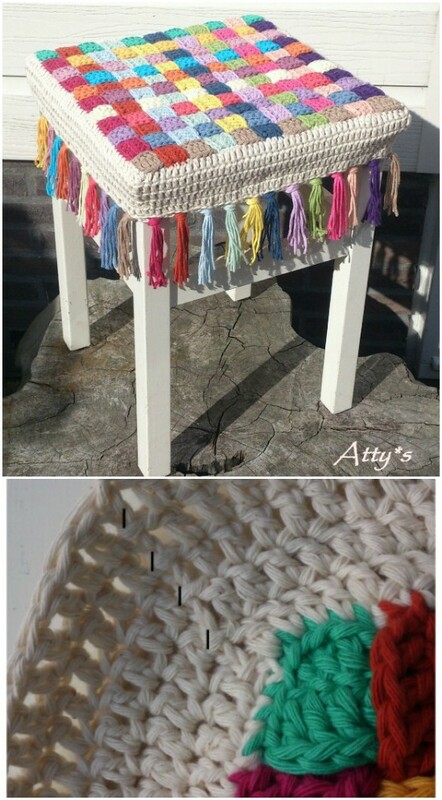 You can totally crochet yourself a nice rug to display in the kitchen or even at the front door! 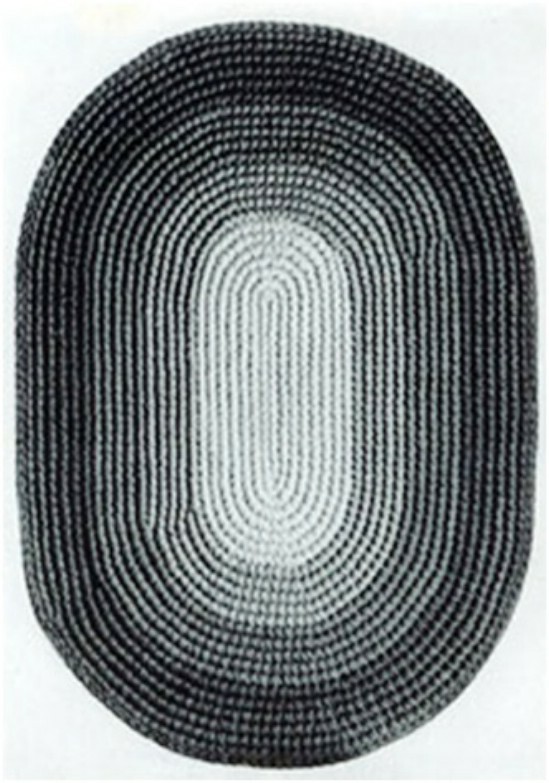 This oval rug uses multiple colors, which gives it dimension but you could stick with just one color if you prefer not to join colors when you’re working. It’s probably going to take longer than an hour to finish, but it’s a nice thick rug that is perfect for standing on when you’re washing dishes – to soften up the floor a bit, or use it in the bathroom to catch water when stepping out of the tub. I have to admit, we change stockings every year at my house during Christmas. Honestly, I don’t think we ever use the same ones two years in a row. These easy to crochet stockings however, may just change all that. You could totally embroider names onto them to personalize them, and they are so easy to make. Plus, you have plenty of time before Christmas so you could crochet one for everyone in the family. They have a great jingle bell decoration, too that makes them so adorable. No, leg warmers did not go out of style with the 80’s. In fact, they’re so warm and cozy that I think they should always be in style. 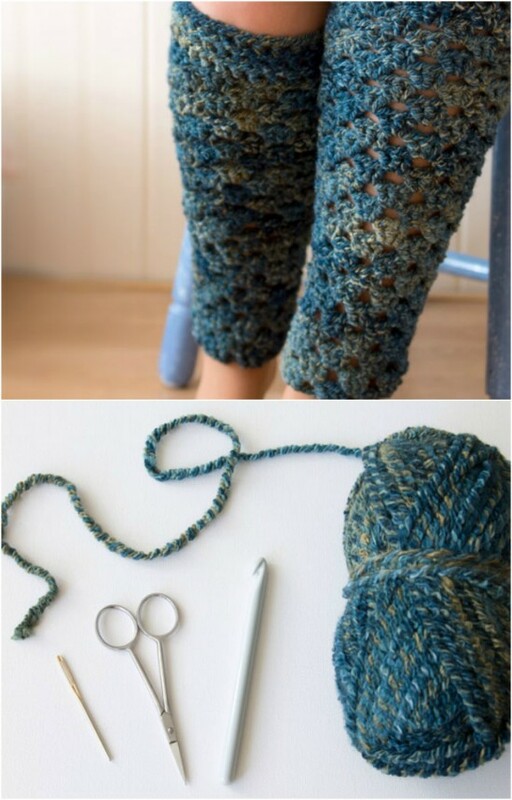 These easy to crochet leg warmers are going to be your favorite accessory during the colder months – especially since they take so very little time to make. You need two to three skeins of yarn, depending on the size and whether you want multiple colors. 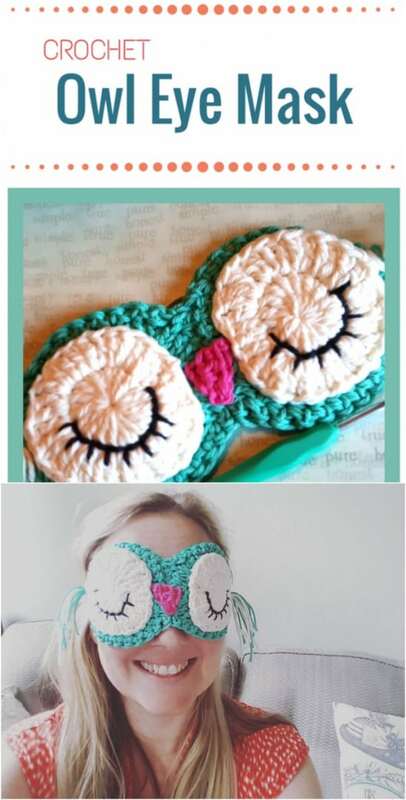 This eye mask is great with its little owl design. I love how easy this is to make and it’s the perfect accessory for your long, relaxing bubble bath. Everything on it is crocheted, including the eyes, which are closed by the way so that you can block out light when wearing the mask. This is a really easy and fun project, and makes the perfect gift for anyone you know who loves to relax. 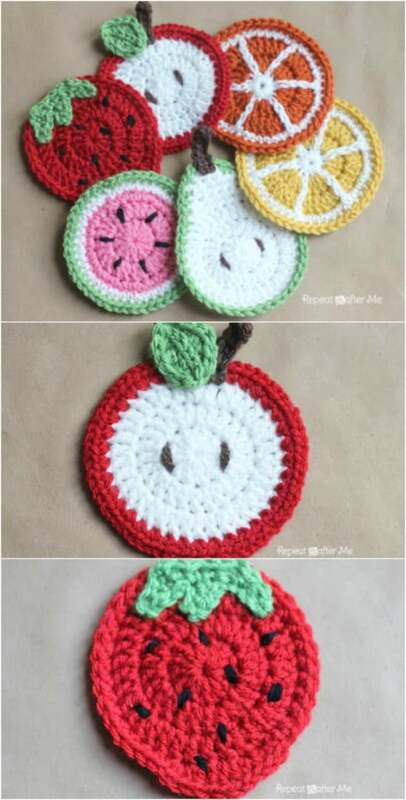 Here’s another great pattern for creating crocheted fruit coasters. These are little fruits, and they are super adorable. You get patterns for all types of fruit, all of which use the same basic ring shape. Just adjust your colors and you’re making different fruits with each one. I love this idea for outdoor entertaining during the warmer months or you could stick a magnet on the backs of these and use them to decorate the refrigerator. This little cat is sure to become a beloved toy. You can make it in any color, you don’t have to stick with black, and you will need a 2.5 crochet hook. He’s just too cute with his big ears. Kids are sure to love him and he would make a wonderful gift at a baby shower or birthday party. This floor pouf acts as an ottoman and gives you a place to rest your feet after a long day of working. I can totally see myself crocheting away with my feet resting on this amazing floor pouf. It takes three skeins of yarn and you’ll need polyester filling to pouf it up. You could also make them a bit more flat and use them as a pet bed. The possibilities are endless, and the pouf won’t take long at all to complete. 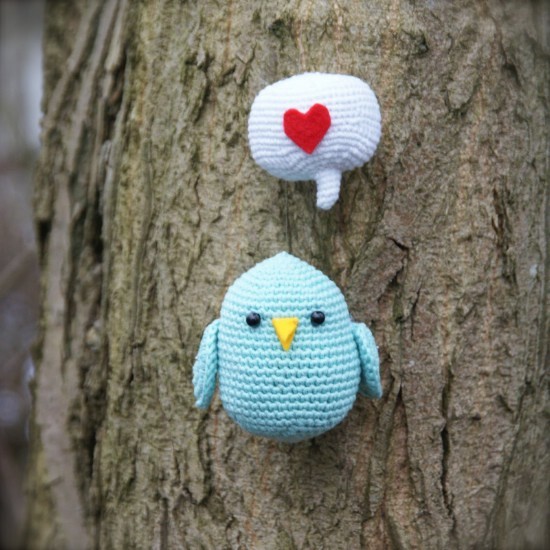 You won’t find a more adorable crocheted toy than this little love bird. He’s super cute and so easy to crochet. You have to join each round with a slip stitch, so if you’re not completely sure how to do that, you may need to brush up. Overall though, this one is pretty easy considering how cute it is, and makes a wonderful baby toy since he’s so soft and cuddly. Why would you want to crochet a postage stamp? Well, why not? I love how creative these are and they are perfect for decorating any number of things around the house. You could make several and join them together to create a postage stamp blanket or pillow, or add magnets and make them refrigerator decorations. Each one will probably take you about 15 minutes minus the decoration, so you could easily finish one completely in half an hour or so. 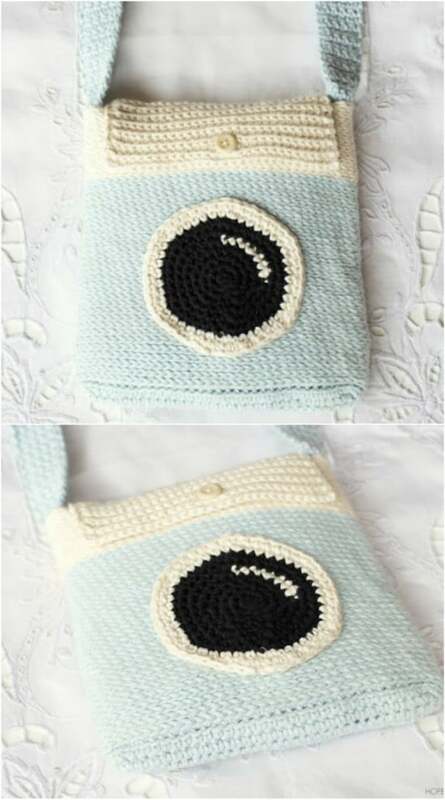 This crocheted bag is really pretty and so easy. It’s perfect for beginners, even with the two different colors. The bag would be great for when you need to travel light or you could use it as a small shopping bag. The texture is gorgeous but the only crochet skills you need are single and double crochet. You’ll also need to know how to crochet a rectangle, which is really simple. 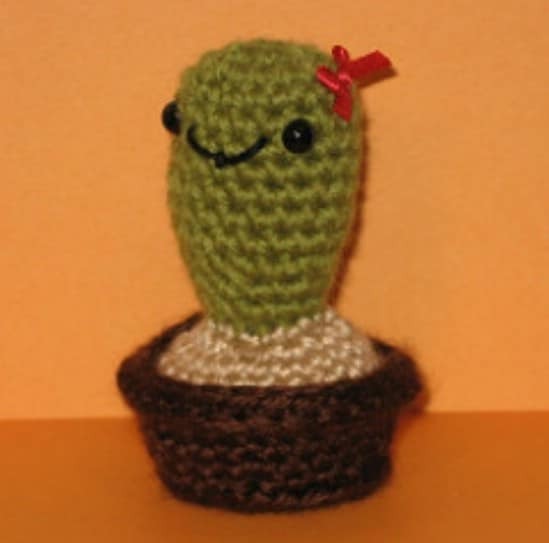 If you want whimsy, this little cactus pin cushion is it. It’s so simple and yet so adorable. You could probably finish this one in about an hour or so, even with the change in colors and the face embellishments. I love the idea of having this little pin cushion sitting around. It’s so decorative while being so functional at the same time. Who says you can’t enjoy donuts every day? 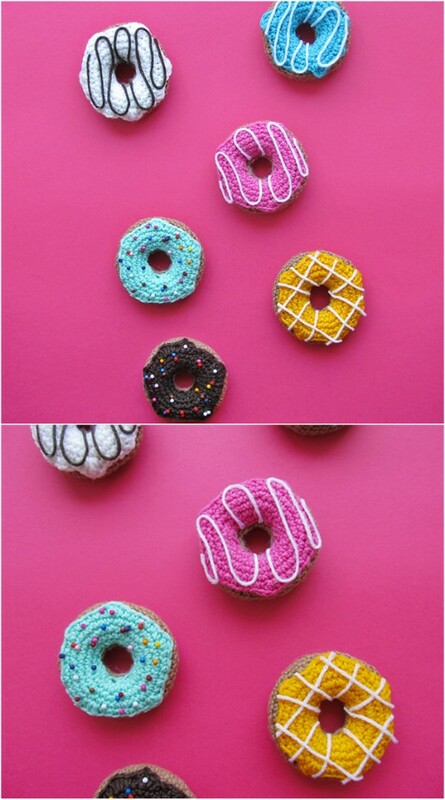 These cute little crocheted donuts are the perfect things for dressing up your refrigerator – just glue magnets to the back when you’re finished. Or, you could use them for decorating pillows for little girls’ rooms or any number of other décor projects. You could even make just one to use for a pin cushion. They’re super simple to make and so colorful! Whether you actually need a camera bag or you just really like the looks of this, it’s a really easy project that is great for beginners. You’ll need a size H crochet hook and a couple of skeins of yarn – about 490 yards in total. I love the decoration on the front that looks like a camera lens, but you could totally leave that off if you wanted to make the project a bit easier and faster to complete. 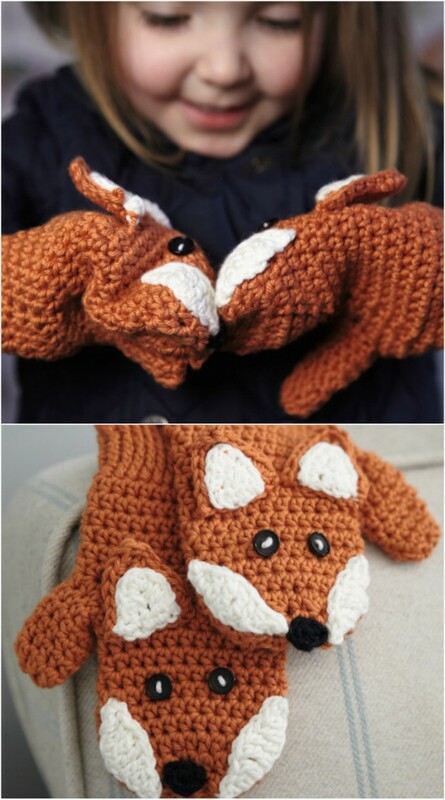 These adorable little mittens resemble foxes, especially if you do them in reds or greys. I love the details on his face, which are really easy to do. As adorable as they are, these mittens classify as easy crocheting projects for beginners, so you are going to be able to make them no matter what your crocheting skill set. Your kids will adore wearing them as much as you love making them. I love the thought of crocheting my own tops and when I get to that point, this lovely broomstick lace top will be one of the first things I try. You can easily increase the size of the top by just adding stitches to your initial chain. I love how breezy this looks and how easy it is to crochet. You make two pieces and then join them with the cap sleeve to finish off the project. This Ombre poncho will cost you around $20 or so to make. You won’t be able to buy it anywhere for that price. It’s a gorgeous five colored poncho that rides a bit shorter than some others. 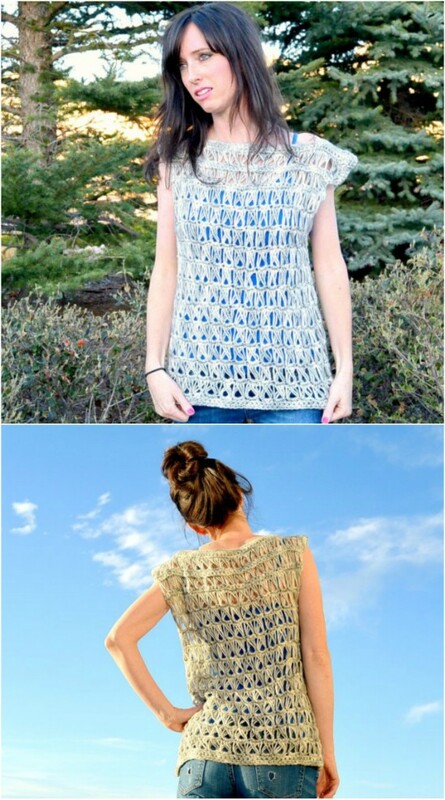 The pattern is really easy, even when you’re switching colors, and the finished project is absolutely gorgeous. You can adjust this one as well to make it longer or shorter by altering your initial stitch count. This chunky scarf is so easy to make and it’s gorgeous when you add the small leather accent, which is really easy too by the way. 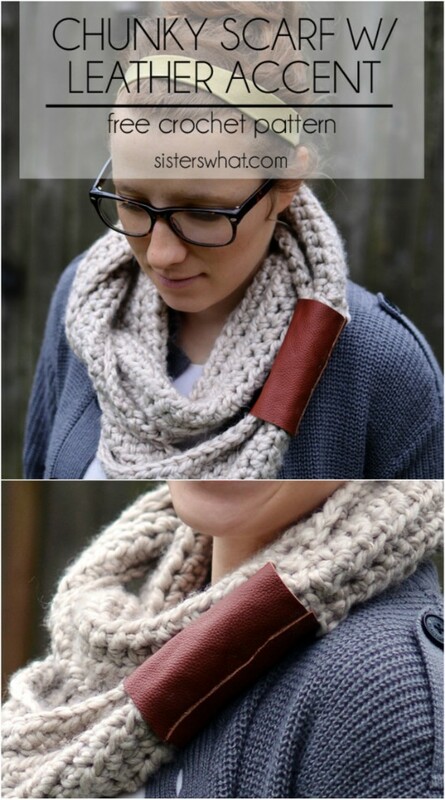 You simply create an infinity scarf, which is much easier than it sounds, and then clamp it together on one side with a piece of leather. 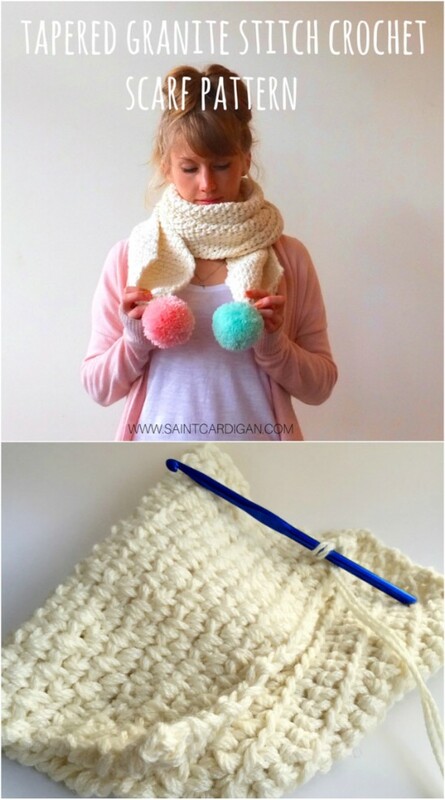 This is a really good project to try your hand on if you’re just beginning to crochet. If you mess up stitches, you can easily hide them under the leather piece. I love the colorful pom poms at the ends of this scarf. You could totally leave those out, but they give it such personality, don’t you think? You begin with chunky yarn, crocheting a triangle and then work out from there. It really is one of the easier scarves to crochet and it’s the perfect beginning project for you or your teen if she wants to learn as well. 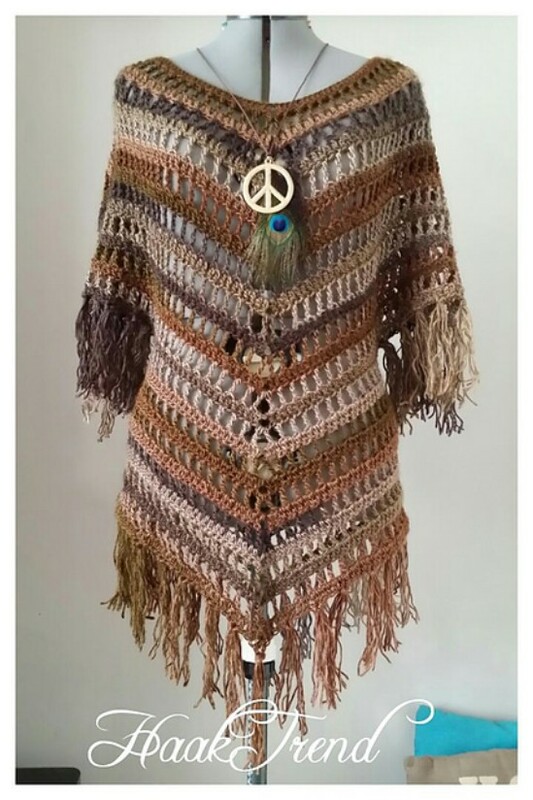 This boho tunic is absolutely fabulous. I love the colors intertwined in it, and the fact that I can make it even though I’m not terribly skilled at crocheting. You can adjust the size easily by adding or subtracting stitches, so it can be made to fit virtually anyone. I love the fringe at the bottom which is also really easy to do. How much do you want to make this hooded cape right now? I love how heavy it is. This would be great for taking along when you’re going to be outdoors and not sure what the weather will be. I especially love the hood, which is not difficult at all to create. This really looks like a complicated crocheting project but fits perfectly with beginning patterns. It’s easy and can be so versatile. 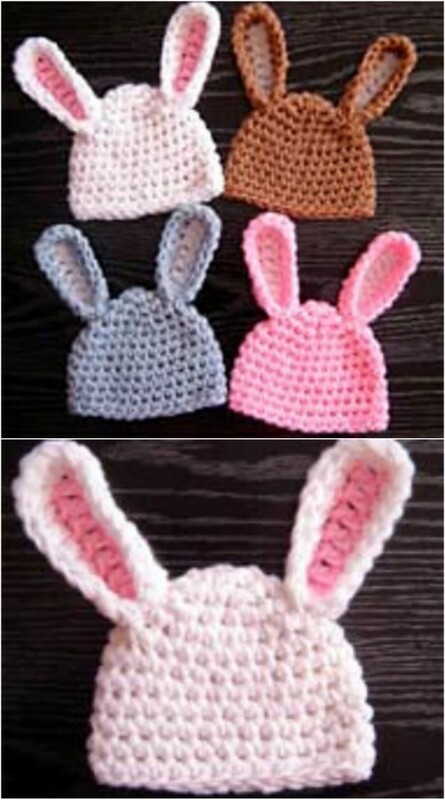 These little bunny hats are so easy to create that you’ll definitely want to make more than one. The patterns fit sizes from preemie to newborn and up to six months. They’re so adorable with their little bunny ears, and you can easily do one of these in just an hour or so. The ears are done separately and then sewn on, which makes it a bit easier than crocheting them in as you go. 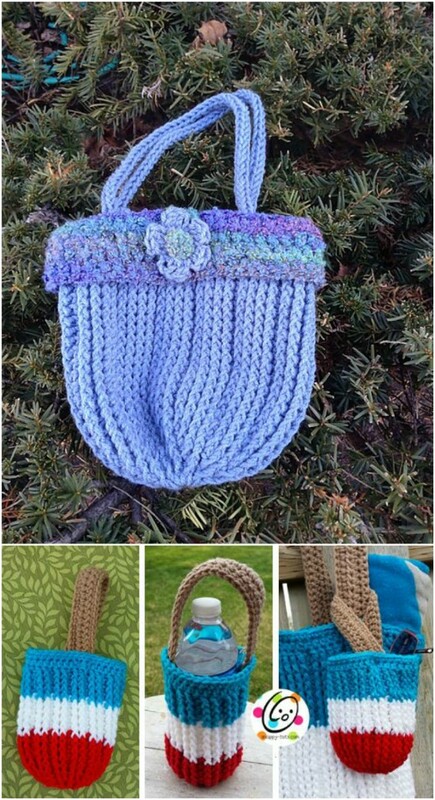 Keep your produce fresh and display your crocheting talents at the same time with this cute little market bag. What’s really great about this one, and what makes it such a wonderful beginner’s project, is gauge doesn’t matter. You may end up with extra yarn which is fine. You can finish off with a single crochet edging around the top and handles. The bag is plenty sturdy enough to hold produce and gives you so much wonderful practice for harder projects. 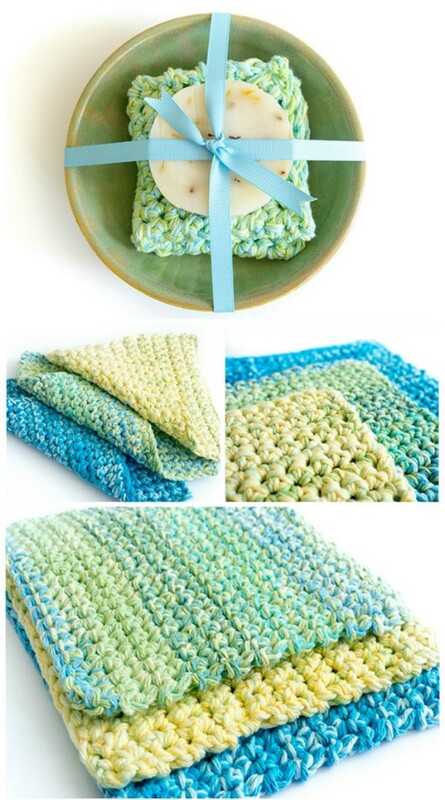 I typically knit my homemade wash cloths, but I’m really anxious to try this crochet pattern, since it’s super easy. This is a great way to practice your gauge and a project that really doesn’t have to be perfect. You can make these in just minutes, depending on your skill set. Even the newest crocheters in the crowd should be able to finish one in under half an hour. Not only do you get loads of practice making these, you also get great, thick new wash cloths. This short cardigan has a bit of slouch, which makes it stylish and it’s light enough that you can wear it during any season. You’ll use about five skeins of yarn, depending on the size and whether you want it longer than the pattern. I love the stylishness of it – you’ll find similar cardigans at department stores for more than $45 each. Making this one will save you money and it’s just so gorgeous! This cat toy really is the perfect beginning crochet project. I mean, your cat won’t mind if you mess up a stitch or two, and the more you make the more practice you get – and the happier your cat will be. You could probably turn this out in less than an hour even if you’ve never crocheted before. It’s a cute toy that contains a ball at one end, and it gives you a few different stitches to practice on. You’ve surely seen the newest in beanies – the bun beanie. This little beanie allows you to wear your hair in a messy bun and have on a beanie at the same time. It’s a great concept. 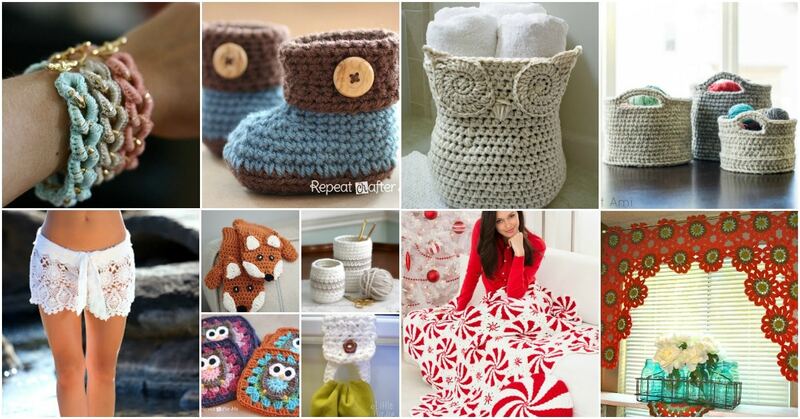 Unfortunately, those things are a bit expensive…unless you crochet your own. And, you can make this one in about an hour, maybe less. Use contrasting colors or just one color of yarn if you prefer. These are so easy you may want to make more than one. Forget about replacing your dust mop when it gets too dirty or buying replacement heads. You can just crochet a cover for it, and then drop the cover in the washer when you need to. This dust mop cover is not at all difficult and you can do it in colors that match your duster or something completely different. Use a heavy yarn so that you grab more dust when your cover is completed. 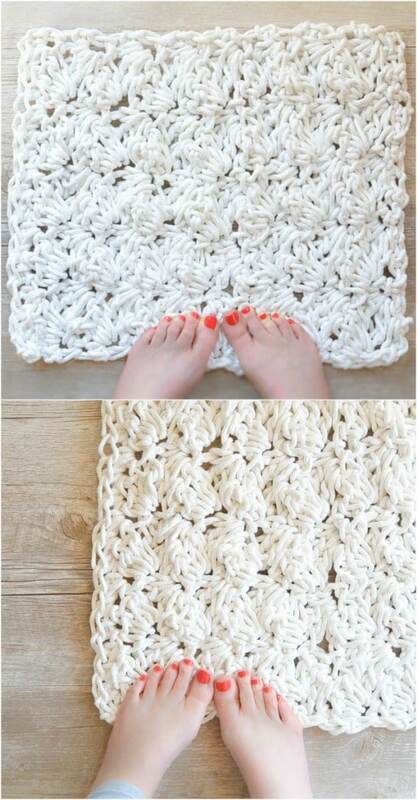 I adore this crocheted bath mat – which is made from rope, by the way. It’s gorgeous and so soft and cushiony under your feet. You can use clotheslines that you get at the Dollar Store for a dollar or so each. You’ll also need a rather large crochet hook. The process is relatively simple, and you can alter the pattern to make the rug as small or as large as you would like it to be. Kids are going to go crazy over these little fishes that double as wash cloths. 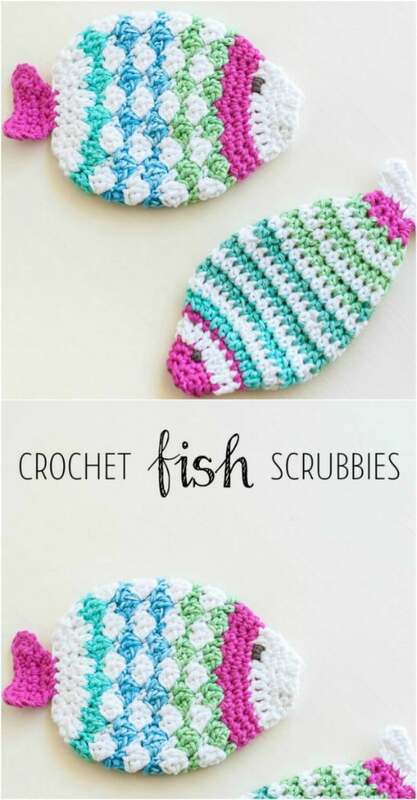 Whether you crochet them for the kids at bath time or make them for dish cloths, they’re just as cute as they can be, and so very easy to crochet. This uses mostly basic stitches, although there are a couple of special ones in there – don’t worry though, they’re really easy. Everything about these fish wash cloths is easy, and they are really cute when they’re finished. 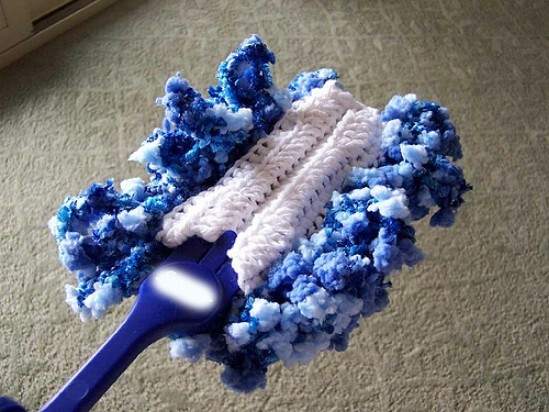 If you have a Swiffer wet mop, you can crochet covers for that mop that saves you from having to buy disposables. 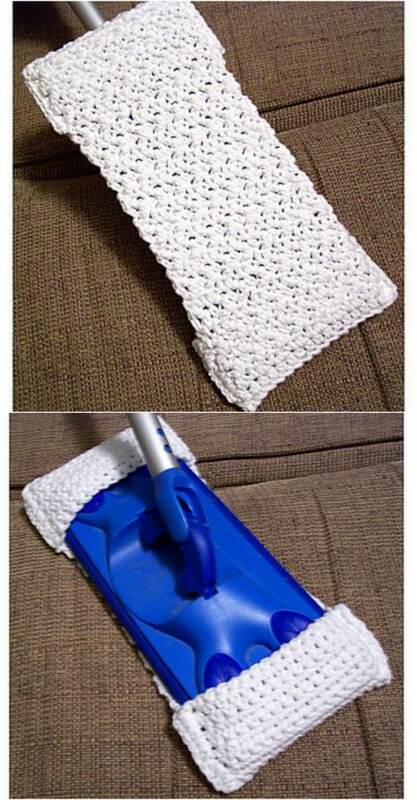 These mop covers are really easy. They’re basically a triangle and you’ll need a little extra on the sides to hold it on. I love the thought of being able to just take them off and drop them in the washing machine when they get too soiled. 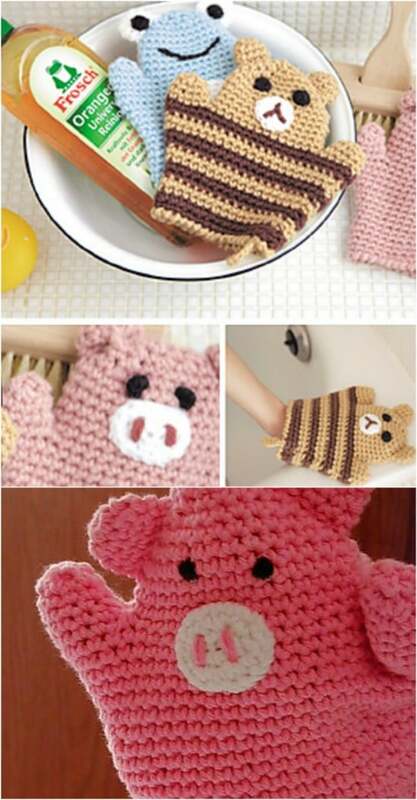 Kids really are going to love these animal shaped wash mitts. These are great if you know someone who is expecting. You could do an entire gift basket of handmade items and add things that you’ve crocheted just for the little one’s arrival. These look so easy and they’re so colorful and fun. Oh my goodness – I can’t believe I even found this one. 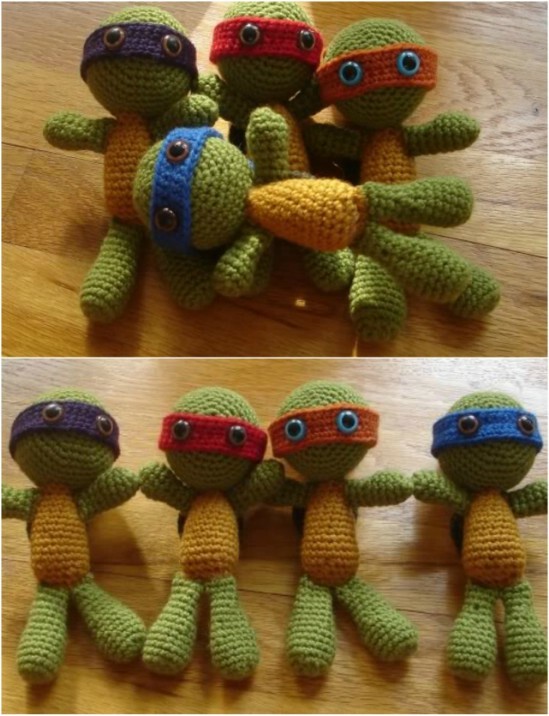 It’s crochet patterns for the Teenage Mutant Ninja Turtles. I can’t tell you how many kids in my family have always loved the TMNT. These are so easy and perfect for beginners. They’re also going to make wonderful gifts for any Teenage Mutant Ninja Turtle fan you may know. Have fun with this one – I know I will! If you live up north in the winter you definitely want to protect babies from the cold and snow!!! These look easy to make and cute. my granddaughters want to learn to Crochet and make something for ir county fair.. I love ALL OF YOUR THINGS. I JUST back crocheting I had a cancer operation then 12 later I had heart operation. And I feel good I can make the’s things. You are wonderful. And may God bless you all.